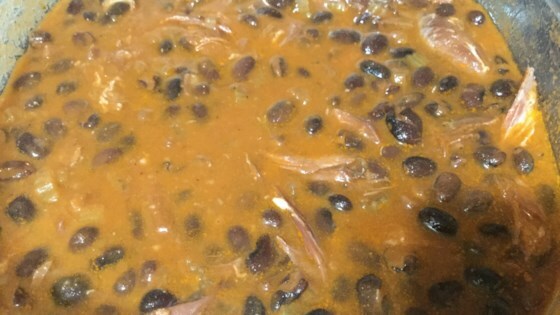 "I live where black beans are a favorite, and I wanted black bean soup with a different taste. The results were wonderfully delicious. Serve with corn muffins. This recipe freezes well. Enjoy." Simmer beans, water, ham bone, broth, and salt for 1 1/2 hours. Discard ham bone. Puree about 1/2 of soup; pour back into pot. Saute onion, tomato, and meat in oil until onion is soft. Stir in vinegar, and then add mixture to beans. Simmer for 20 minutes. Serve hot. I did not like the vinegar in there at all. Very good! I did reduce the amount of water and I added about a teaspoon of cocoa. And DO NOT leave out the vinegar, it gives the soup the best flavor!